It’s something I don’t do enough: say thank you, say I remember you. But recently I recalled a former teacher, Mr. Mullen, whom I studied under for two art classes at the College of Oneonta. I was an English major, but the approach I took at the time was to take as many classes as possible, with an emphasis on the best teachers regardless of discipline. That’s how I found Mr. Mullen, who taught a variety of art survey and appreciation courses in addition to studio art classes for practicing artists. 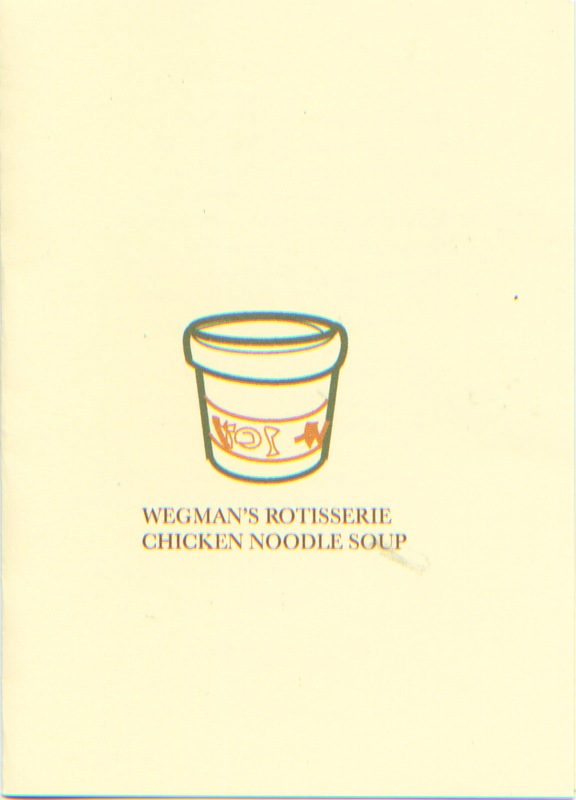 Original digital drawing by James Mullen — and the cover of the card he sent to me. I really liked and admired this man. I’d see him around campus and he always had time for me. I’d stop by his office to talk. I can still remember the thrill I felt when he suggested we go for a cup of coffee, as if we were equals. At the time I’d been writing sporadically for the school newspaper — freelance style, where the editor basically printed whatever I gave him, without deadlines — and Mr. Mullen was always interested and thoughtful in his comments. He liked my righteous indignation, I guess. We talked about stuff. And, obviously, clearly, he cared about me. I’m still grateful for that. I located Mr. Mullen a few years back. He’s retired now, living in Endwell, NY, of all places. We joked about that, how I supposed he had picked the perfect town for his retirement years. Let’s hope so, right? Anyway, I hadn’t written to him in a while until recently when, out of the blue, I popped a book in an envelope and included a brief note. I’m sure I told him how well I remember his kindess, and what a great teacher he was, and, well, thank you, again. 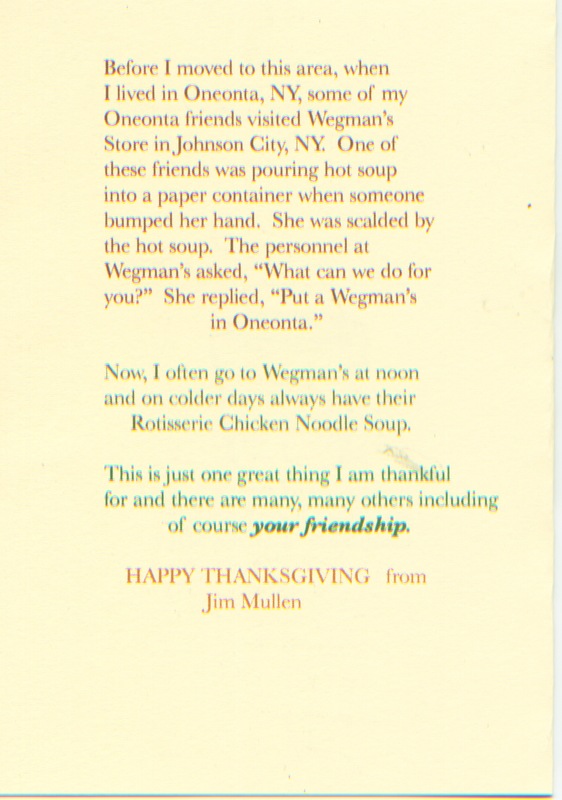 Still a practicing artist who favors working in the miniature, Mr. Mullen replied with a card of his own, a paean of sorts to Wegman’s, and to friendship. I think that card tells you something about Jim Mullen and the graceful, dignified way he walks through life. He is a good man and, therefore, a treasure. I don’t often do the right thing. Or at least, not often enough. But I’m trying, in my old age, to do a little bit better in terms of kindness and generosity. And what I keep learning, over and over, is that every time I give, I invariably receive more in return. I wrote an old teacher a letter. A note of thanks. And I’m here today to suggest to you that maybe you should consider trying it yourself, if you haven’t already. Send that note. Say thank you, say I remember. I promise that you’ll be glad you did. 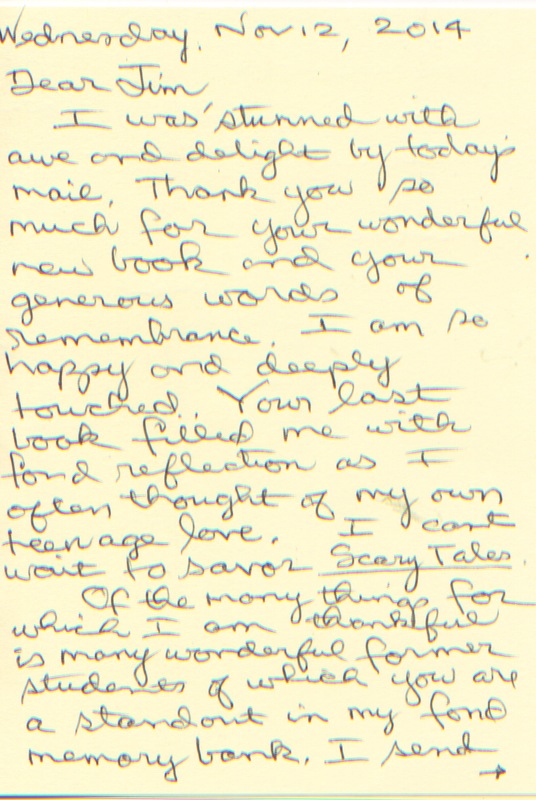 In his response to me, Mr. Mullen recalled a book I had sent him a few years back, a Young Adult novel titled BEFORE YOU GO. I hesitated about including a section of his handwritten response here in blogland, but in the end I think there’s value in sharing it, if only to underscore that it meant something to him. Teachers’ hearts are made glad to be remembered. 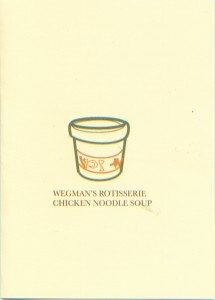 And now I have a new goal in life: to have a cup of rotisserie chicken noodle soup in Wegman’s with good, old Mr. Mullen. Wouldn’t that be something?